*FINALIST ‘Video’ Category in the BritMums Brilliance In Blogging Awards 2016. *FINALIST ‘Blog of the Year’ 2016 MAD Blog Awards. *FINALIST ‘Best Photography Blog’ 2016 MAD Blog Awards. *WINNER– Space In Your Case (my travel blog) won ‘Best Family Travel Blog’ at the BritMums Brilliance in Blogging Awards. 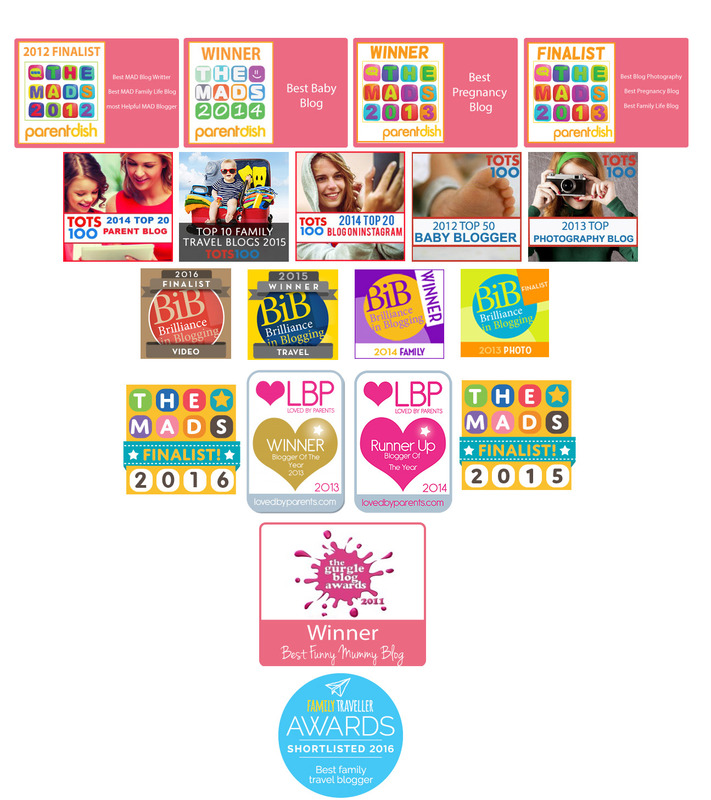 *FINALIST– ‘Best Photo Blog’ and ‘Best Preschool Blog’ at the 2015 MAD Blog Awards. *FINALIST- DFDS Seaways Best Travel Photo Blogger. *WINNER – ‘Best Baby Blog’ at the 2014 MAD Blog Awards. *WINNER– ‘Family’ category at the Brit Mums Brilliance in Blogging Awards 2014. *RUNNER UP– Loved By Parents ‘Blogger of the Year’ 2014 Awards. *FINALIST – ‘Family’ category at the Brit Mums Brilliance in Blogging Awards 2014. *FINALIST – Two categories in the Mad Blog Awards 2014- ‘Best Baby Blog’ and ‘Best Photo Blog’ out of 170,000 nominations. *No 16 of the Top 20 Parent Blogs 2014. *No 16 of the Top 20 Parent Bloggers on Instagram. * WINNER– 2013 ‘Best Pregnancy Blog’ in the MAD Blog Awards out of 150,000 nominations. *WINNER– ‘Blogger of the Year’ Loved by Parents Awards 2013. *FINALIST– ‘Best Blog Photography’, ‘Best Family Life Blog’ and ‘Best Pregnancy Blog’- 2013 Mad Blog Awards. *FINALIST– 2013 Brit Mums BIB awards- ‘Photo’. *SHORTLISTED– Only blog to be shortlisted in four categories in the Brit Mums BIB awards- Photo, Family, Lifestyle and Video. *FINALIST– 2012 MAD Blog Awards- ‘Best Blog Writer’, ‘Best Family Life Blog’ and ‘Most Helpful Blogger’ out of 50,000 nominations. *RUNNER UP– 2013 ‘Blogger of the Year’ Loved By Parents awards out of only five blogs chosen. *SHORTLISTED– 2012 Brit Mums BIB awards- ‘Style’ category. *WINNER– ‘Best Funny Mummy Blog’ – Gurgle/Mothercare Blog awards. I am also in the Top 10 2013 Cision UK Mummy Blogs and the Top 10 2013 Cision UK Baby Blogs and a Top 50 Tots 100 Baby Blogger, as well as a Top 20 UK Photography Blog. I also feature regularly in the Top 10 of the Tots 100 blogs out of 7000 blogs in the index, including being ranked No 1 several times. My blog is often featured in the press, including Gurgle, Prima Baby, Mother and Baby, At Home, Very and OK! Magazines. I also was featured as one of the Top 10 Mummy Instagram Accounts to follow over on the Daily Mail. I also write on a freelance basis for publications, including Thomas Cook Airline magazine and Sovereign Arrival magazine.